No surprises there. It will just as surely say that opposition from Indonesia makes Abbott’s plan to turn back boats to Indonesia impossible. It will ignore the host of submissions from refugee groups arguing that the government must stop talking about stopping the boats and start providing safety and security for asylum seekers, and that that must include guaranteed, timely resettlement of refugees in Australia. 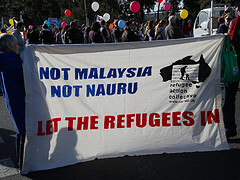 It will ignore the options for giving asylum seekers safe passage from Indonesia to Australia. The scene is set for yet another round of the government’s push to impose the Malaysia solution to expel 800 asylum seekers. He remains willing to make massive concession to the Liberals, saying the government will start processing on Nauru as long as the Labor government can expel people to Malaysia. Labor is even prepared to review Howard’s policy of temporary protection visas (TPVs) that Rudd had abolished. Rob Oakeshott has already announced that he will be re-submitting his pro-Malaysia solution bill. The Liberals have said they will oppose it, as will The Greens. That means nothing is likely to pass the Senate and the “debate” and refugee-bashing from Gillard and Abbott will continue. A common feature of the submissions from refugee groups was complete opposition to offshore processing. Importantly, many also argued to de-link onshore refugee applications (the asylum seekers who come by boat) from the Special Humanitarian Program, under which most applications for family reunion are made. Howard linked these two programs together in 1996. It means that for every asylum seeker who arrives on a boat and is accepted as a refugee, the government takes one place from the Special Humanitarian Program. It was a deliberate, vindictive measure to divide refugee communities already in Australia from those arriving by boat. Supposedly, it provides an incentive for “orderly” migration of families of refugees to Australia. But as the number of boat arrivals has grown, the linkage has meant that family reunion is now almost impossible. So the policy is actually pushing the families onto boats because they can’t get here any other way. Chris Bowen says the government is concerned about asylum seekers taking boat journeys. But delinking the two programs is one very simple thing he could do to ensure that some people had an alternative to a boat. He won’t do it. Saying one thing and doing another has a name—hypocrisy.